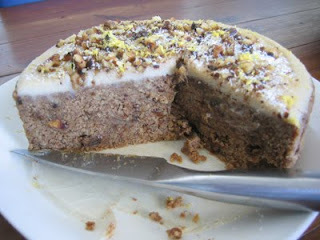 Everyone loves Banana Cake and something was screaming at me to make a raw Hummingbird cake as I had some beautiful pineapples, organic sundried bananas and beautiful organic coconut flour.. so here's what transpired..
Hummingbird Cake - raw vegan! Add walnuts, coconut, vanilla and cinnamon to bowl of a food processor and process until a fine meal then put into a large mixing bowl. Then add dates to food processor and blend until a paste then add pineapple and chopped bananas and blend until roughly chopped and combined. Add wet mix to dry mix and stir until well combined then press into a cheeze cake pan, I put paper on the bottom to stop in sticking. Smooth the top and refrigerate for about 4 hours then run a knife around the edge and release it from the pan and slide onto a plate then spread frosting.. Lemon - juiced and zested. The cake looks delicious! Thanks for sharing your recipe.